In the era of Evidence Based Medicine, health professionals are required to fully understand design, analysis and interpretation of the results of research. Furthermore, they should be able to assess the needs of their communities and respond accordingly. To achieve these goals, clinicians need to be familiar with the basic concepts of epidemiology and biostatistics. But epidemiology is more than “the study of.” Its application and practice are essential to address public health issues. That is why this book provides not only the theory, but also the opportunity of applying it in practice. 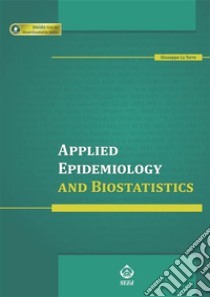 In fact, each chapter presents one or more specific examples on how to perform an epidemiological or statistical data analysis and includes download access to the software and databases, giving the reader the possibility of replicating the analyses described. The final purpose is, therefore, to introduce epidemiologic and biostatistical methods as applied to clinical research, and to develop proficiency with computer software for performing the analysis of clinical datasets.